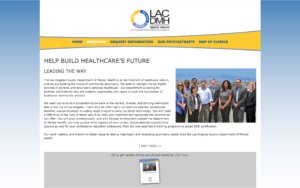 CONSTANT has provided marketing for psychiatrist recruitment for the Los Angeles County Department of Mental Health since 2014. Working with the largest psychiatrist department in the nation, CONSTANT worked on new concepts for both print and online marketing efforts. On an annual basis, this marketing campaign includes website design, photography shoots, video production, advertising design, email marketing, print collateral, publication and online marketing, and event management. Recruitment marketing efforts also include creation and outreach to database that expands throughout the nation. Monthly marketing data are then transferred to periodic reports that outlines daily search engine results and online form signups.